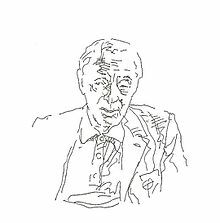 Ba scríbhneoir Ceanadach é Saul Bellow (10 Meitheamh 1915 - 5 Aibreán 2005). Bhain sé amach Duais Nobel na Litríochta sa bhliain 1972 agus an Bonn Náisiúnta Ealaíon, 1988. Is mar úrscéalaí ag déanamh fiosrúchán ar an uaigneas aonarach, an míshásamh anamúil agus ar na féidearthachtaí athmhúscailte daonna atá clú air. Ó Chicago a fuair sé a inspioráid agus tá an mhórchuid dá fhicsean suite sa chathair sin. Tá meascán le feiceáil ina shaothar den chultúr ard agus íseal agus ina chuid carachtar tá meascán i gceist d'fhir intleachtúla aislingeacha agus daoine sráidghlice agus muiníneacha. Rugadh Solomon Bellows (leasainm Sollie) i Lachine (Montreal anois), Quebec tamall i ndiaidh dá thuismitheoirí teacht mar inimircigh as St Petersburg, an Rúis. Níl sé soiléir cé acu a rugadh Bellows (d’fhág sé an s ar lár óna shloinne níos déanaí) i Meitheamh nó Iúil 1915 mar gheall ar go raibh claonadh ag na hinimircigh Ghiúdacha ag an am a bheith míchúramach maidir leis an fhéilire Críostaíochta. Tháinig galar análaithe air nuair nach raibh sé ach cúig bliana d’aois, agus ag an am sin d’fhoghlaim sé féinmhuinín agus bhí deis aige an dúil a bhí aige sa litríocht a shásamh. Tuairiscítear gur chinn sé ar a bheith ina scríbhneoir i ndiaidh leabhar Harriet Beecher Stowe, Uncle Tom's Cabin, a léamh. Nuair a bhí Bellow 16 bliana d’aois, d’aistrigh a theaghlach go dtí cúlsráideanna churacha Chicago, cathair a bheadh ina cúlra do mhórán dá chuid úrscéalta. Bhí athair Bellows, Abram, ina iompórtálaí oinniún, d’oibrigh sé i mbácús fosta, mar sheachadóir guail agus mar smuigléir alcóil. D’éag máthair Bellow, Liza, nuair a bhí Bellows seacht mbliana déag d’aois. Ba dhuine an-diaganta, cráifeach í agus bhí sí ag iarraidh a mac is óige a bheith ina veidhleadóir ceolchoirme nó ina raibí. D’fhreastail Bellows ar Ollscoil Chicago ach ina dhiaidh sin d’aistrigh sé go hOllscoil an Iar-Thuaiscirt. Ar dtús, bhí sé ar intinn aige staidéar a dhéanamh ar an litríocht ach fuair sé amach go raibh frithghiúdachas i Roinn an Bhéarla agus, ina áit sin, bhain sé amach céim onóracha san Antraipeolaíocht agus sa tSocheolaíocht. Chuir Bellows tús lena shaol mar scríbhneoir agus é an-óg. I rith an Dara Cogadh Domhanda chuaigh Bellow isteach sa Loingeas Trádála. Ag an am sin scríobh Bellows a chéad leabhar, Dangling Man (1944), úrscéal faoi fhear ag fanacht ar ghlao dul go dtí an cogadh. I 1948 bhain sé amach scoláireacht Guggenheim, rud a thug deis dó dul go Páras, áit ar chuir sé tús lena úrscéal The Adventures of Augie Marsh (1952). Thug na léirmheastóirí faoi deara na cosúlachtaí idir an leabhar seo agus an leabhar mór Spáinneach Don Quixote. Bhí sé scríofa i stíl chomhráiteach ach fealsúnach agus chuidigh an leabhar seo leis cáil a bhaint amach mar scríbhneoir. Chónaigh sé i Nua-Eabhrac ar feadh na mblianta ach chuaigh sé ar ais go Chicago mar Ollamh in Ollscoil Chicago i 1962. Bhí a úrscéal Hertzog, leabhar faoi ollamh coláiste, meánaosta, cráite, imníoch, ar liosta na leabhar ba mhó ráchairte i 1954. Bhí iontas ar Bellow faoi rath an úrscéil seo agus chuaigh sé ar ais chuig an ábhar céanna lena chéad saothar eile, Humboldt’s Gift (1975), bunaithe ar a iarchara ardéirime ach féinbhasctha, an file Delmore Schwartz. Chuidigh an rath a bhí air Duais Nobel na Litríochta a bhaint amach i 1976. Bellow sa leabhar, Razgovori (Conversations, 1999), by Dejan Stojanović. Fear mór siúil ab é Bellow agus thaistil sé cuid mhór i rith a shaoil. Théadh sé chun na hEorpa dhá uair achan bhliain agus go háiteanna eile fosta. Mar fhear óg chuaigh sé go Meicsiceo chun aithne a chur ar an réabhlóidí Rúiseach Trotsky ach feallmharaíodh é an lá sula raibh siad le casadh le chéile. Bhí aithne ag Bellow ar chiorcal leathan daoine, Robert Kennedy, cuir i gcás, agus ar an taobh eile ar áibhirseoirí Chicago. Phós Bellow cúig huaire ina shaol, agus fuair sé colscaradh ceithre huaire. Agus é 84 bliain d’aois bhí iníon ag Bellow agus a chúigiú bean chéile, Janis. In ainneoin rath a chuid leabhar, lean Bellow ar aghaidh lena chuid múinteoireachta, in Ollscoil Minnesota, Nua-Eabhrac, Ollscoil Puerto Rico, Ollscoil Bard, Ollscoil Boston agus Princeton. D’aistrigh Bellow ó Chicago go dtí Brookline, Massachusetts, áit ar éag sé ar an 5 Aibreán 2005 agus é 89 bliain d’aois. Cuireadh é sa Reilig Ghiúdach Shir he harim i Vermont. Tugadh an leathanach seo cothrom le dáta an 4 Aibreán 2017 ag 22:59.